WASHINGTON, D.C., Feb 26, 2015 – Today, at the National Opportunity Summit in Washington, D.C., Walmart and the Walmart Foundation will announce an initial investment of $16 million to seven national nonprofit organizations, as part of a new Opportunity initiative, a $100 million commitment to help increase the economic mobility of entry level workers in retail and adjacent sectors. This significant investment aims to address some fundamental challenges to advancement, including the skills gap among U.S. workers. The $100 million commitment was first announced last week by Walmart President and CEO Doug McMillon, in conjunction with the roll out of new opportunities and enhanced benefits for Walmart associates. “We are delighted that Walmart is among the growing group of employers investing in education and employment opportunities for workers across the country," said Russell Krumnow, managing director of Opportunity Nation. “The National Opportunity Summit is an event where leaders from all sectors can come together around shared ideas to restore opportunity in America, and commit to action that will transform our businesses, communities and our country." The skills gap among workers is a pressing issue facing the United States today. According to the Bridge the Gap report published by Harvard Business School, 51 percent of retailers find it difficult to fill middle- skills roles. With an initial investment of $16 million in grants, Walmart and the Walmart Foundation will help more than 12,000 retail and related sector workers gain the knowledge and training they need to advance in their careers through programs offered by the following nonprofit organizations: Achieving the Dream, The ACT Foundation, Dress for Success, Goodwill Industries, Jobs for the Future, McKinsey Social Initiative and the National Able Network. The programs will provide skills training, job placement support and develop interactive maps to showcase career paths within retail and adjacent sectors. 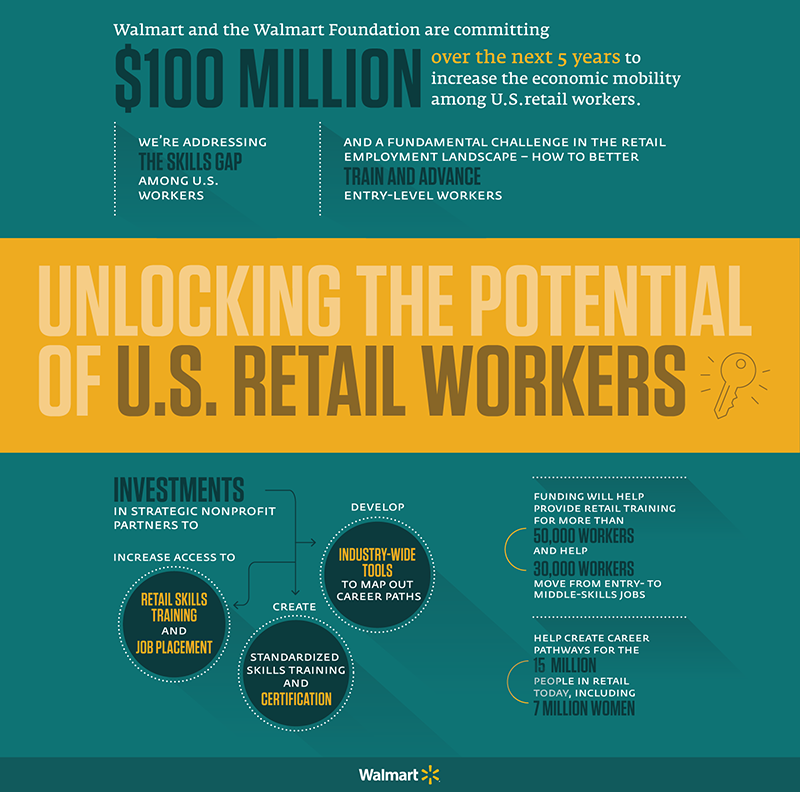 Walmart and the Walmart Foundation’s $100 million commitment over five years will create the career maps, training approaches and alignment among employers and training providers that will help many of the 15 million people working in retail today, including seven million women. In developing these tools and practices, the Walmart Foundation will support programs that directly help 50,000 people, including 30,000 workers move from entry level to middle-skills jobs. The commitment is part of the Walmart Foundation’s focus on creating economic opportunities for individuals globally. The Foundation is also committed to helping people live better through philanthropic efforts in the areas of sustainability and community.